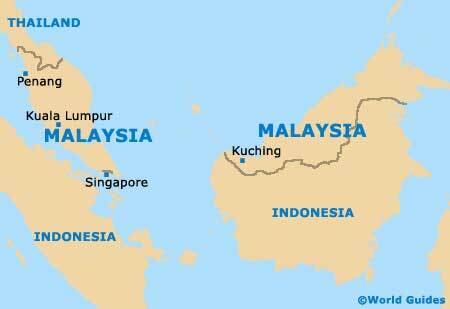 Standing within South-East Asia, the country of Malaysia lies on a long peninsula on the Asian mainland, and also occupies a northern territory on the island of Borneo. Peninsula Malaysia borders Thailand to the north, while the island state of Singapore is to the south, being linked by both a causeway and bridge. Malaysia is home to many wonderful coastal expanses and is situated alongside the South China Sea, as well as the Straits of Malacca. Kuala Lumpur is the Malaysian capital and largest city, and contains some spectacular sights, such as the world-famous Petronas Twin Towers. Both the Golden Triangle and Kuala Lumpur City Centre (KLCC) are especially tourist-friendly here. The island of Penang is another favoured tourist destination in Malaysia and is where you will discover everything from beaches and jungles, to culture and superb restaurants, particularly within Georgetown, Penang's capital. Also worth a mention in Malaysia are the cities of Ipoh, Johor Bahru, Kota Kinabalu, Kuching, Malacca, Miri and Putrajaya, the latter of which serves as the country's administrative centre and is famed for its spectacular architecture, with highlights including the Putra Perdana mosque and the Seri Perdana (the residence of the Malaysian Prime Minister). Located on the island of Penang, Georgetown serves as the capital city. The majority of Georgetown's most-visited sights can be easily reached by foot or trishaw, including its old colonial district and the 19th-century Fort Cornwallis. Capital of the Perak state, Ipoh gained much of its prosperity from its former tin mines within the Kinta Valley. Next to the Kinta River, the Old Town is where the main tourist attractions reside, with its Birch Memorial Clock Tower standing out. Influenced by its proximity to Singapore, rapidly expanding Johor Bahru has grown to become one of Malaysia's biggest cities. Whilst not known for its tourism opportunities, Johor Bahru does lie close to numerous beaches. A prominent and much-visited tourist destination, Kota Kinabalu is the principal city on the island of Borneo and is a notable gateway to Mount Kinabalu. Scuba diving, water sports and beaches can all be enjoyed here. Kuala Lumpur has grown from a small town into a huge, cosmopolitan city in just 100 years. Over recent decades, many spectacular buildings have arrived in Kuala Lumpur, with the Petronas Twin Towers being especially iconic. The port city of Kuantan is the capital of the Malaysian state of Pahang. A popular tropical getaway, Kuantan relies heavily upon income generated by tourism, with the nearby Teluk Chempedak Beach drawing crowds. Capital of the Sarawak state, Kuching is a good place to base yourself for an adventure on Borneo. The shophouses situated in the Chinatown district are especially appealing, as are the attractions lining the Sungai Serawak river. Langkawi is to be found off the north-westerly shore of Peninsula Malaysia, where it is a notable archipelago comprising almost 100 islands. Pulau Langkawi is considered to be the main island and has beaches aplenty. Malacca (Melaka City) has never been more popular, thanks in no small part to it gaining the prestigious title of World Heritage Site. History abounds in Malacca, with many buildings being Dutch and Portuguese in style. The island of Penang is something of a Malaysian tourist hotspot and boasts many inviting beaches, lush jungles and some exceptional restaurants. Penang's main resorts include Batu Ferringhi and the World Heritage Site of Georgetown. Belonging to Greater Kuala Lumpur, Shah Alam may not be a typical tourist magnet, but it does feature a number of sightseeing options. These include the Lake Gardens and the Sultan Salahuddin Abdul Aziz Mosque.